Just look at this beautiful celery!! There are so many ways to make fermented foods, and there are so many fermented food recipes. Then there are cultured vegetables, which is what I am becoming at master at! Well, or so I think! After considerable research I decided to try a new way to make cultured vegetables. I am making a brine first and then fermenting the veggies in individual jars, with a little brine added to inspire fermentation. Last month I ran into a farmer friend and he said he made all his cultured vegetables from fresh grown celery, no cabbage. He said they were fantastic. 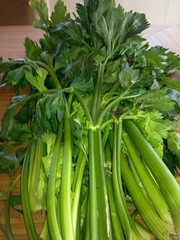 Here on Maui it is hard to find local celery, and if you do, it looks more like the celery in the picture. It is dark green, very strong in flavor, and a bit hard to chew. You do not see it at the local farmers markets. But, I was intrigued, and kept thinking about doing some kind of culturing with celery. So, the other night while up in Kula (up-country Maui), I asked my friends, who have a huge garden full of organic vegetables for their friends to pick fresh, if they had any celery. Yep, they answered and proceeded to put a flashlight band on my head, sending me out to pick in the dark. What you see in this picture is what I picked. I brought it home, washed and juiced it to make a brine for fermenting vegetables. Then I added the juice of 1 1/2 apples, 2 tsp. of sugar, and 1 tsp salt. To this extraordinary mixture I added a Cultured Vegetable starter from Wilderness Family Naturals, and put the brine to be mixture in my dehydrator to warm and ferment over night. Today I removed it and refrigerated it. But, not without a taste. Well, it tasted sort of sour and sweet. 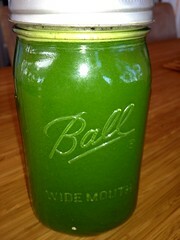 You could definitely taste the fermentation of the celery juice. My next step will be to make a big batch of veggies and place them in individual jars for fermenting. In each jar I will add a little of this celery brine starter and then let the jars sit for a couple of weeks to ferment. Stay tuned. I will keep you in on the process!! Meanwhile, if you have some extra veggies that you want to juice, how about making a delicious brine out of it for fermenting vegetables or just for drinking! Your gut will love it!